Brian Bailey's photo slide show for FRIDAY is directly below. His daily report is below the slide show. Purple-clad fans were out in force at the Liberty Bowl. Pirates Enter Field through Purple Haze. Darryl Freeney scored on an 80-yard pass play. ECU fans react to Freeney's 2nd quarter touchdown. Patrick Pinkney talks to the media after the game. 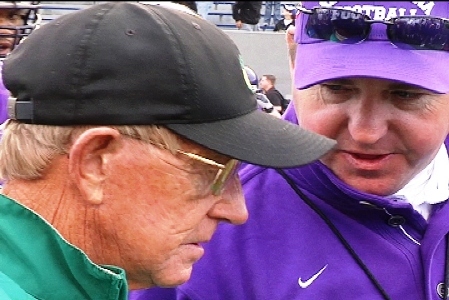 WNCT-TV 9 Sports Director Brian Bailey is on the scene in Memphis this week bringing daily coverage of East Carolina's preparations for the 2009 AutoZone Liberty Bowl to Bonesville's readers and Channel 9's viewers. Editor's note: Brian Bailey's duties on game day focused on photography only. Select the following links to view his daily written reports and slide shows for Monday, Tuesday, Wednesday and Thursday. The Friday link is for Bailey's game day slide show. Content: Brian Bailey. ©2009 Bonesville.net and WNCT-TV 9. All rights reserved. PAGE UPDATED 01/03/09 05:08 AM.